This week: This time, I think about my experiences I made as I played Life is Strange for the first time. Recently, as I was looking through my Steam library in order to find a short but still very atmospheric game I could complete over the course of the Easter holidays, I rediscovered Life is Strange. Since the release of it in January 2015, I wanted to give this game a try as it was rated as very atmospheric and emotional. Unfortunately, I had not the time to play it right away and so I postponed the purchase. At some point, however, I got the game as I bought a Humble Bundle game bundle. Since then, it was waiting in my library for the right moment. After downloading and installing Life is Strange, I was immediately amazed by its atmosphere and immersive effect. 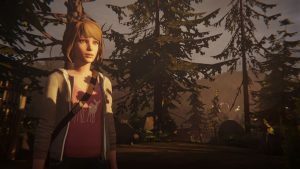 In this adventure game, the players takes control over Max Caulfield, a photography senior who, at the start of the game, experiences a very real daydream and suddenly wakes up in the middle of a photography seminar. During the exploration phase, Max is controlled from a 3rd person perspective and can interact with the environment as well as with other non-player characters. That way, the user can explore the environment and search for items that are needed in order to solve the game’s puzzles. However, once a player begins a conversation, the game changes to cutscenes that take advantage of settings used in movies. Aside from solving puzzles and exploring the virtual word, players can also access Max’s journal which is beautifully decorated with pictures, drawings and other remarks thus adding an additional emotional layer to the game’s story. The journal is used in order to document a player’s decisions as Life is Strange provides multiple endings depending on the player’s choices throughout the gameplay. Hence, the journal actually reflects the actions a player did inside of the game. Moreover, the game uses the journal-drawing style as a general style for the game: all text in the game (main menu items, confirmation screens) use the same handwriting font that is also used in the journal. Also, the mouse cursor looks like as if it was drawn with a pencil. Making decisions is the most important aspect of Life is Strange as Max is able to rewind time in order to change the topic of a conversation or even save someone’s life. That way, the game incorporates the idea of the butterfly effect that even a small change can have a significant impact on other things in the future. This is even emphasized as, during the initial part of the game as the player gets introduced to this game mechanic, Max is about to take a picture of a blue butterfly. In addition to Max’s personal journal, players are able to hear the girl’s thoughts on recent events which are presented in a very personal and subjective way thus causing the players to feel with the game’s main character and often to develop an emotional connection to her. The emotional aspects of the game are even emphasized as the game uses a very emotional indy music. The music not only increased the game’s atmosphere and emotional aspects, but was also used to immerse the player in the game: at the end of the seminar, Max puts her earphones on and starts to listen to some music. Right in this moment, the game also started to play a song at a higher volume thus suggesting that the player itself is listening to the music via earphones. Personally, I experienced exactly this moment as a very immersive part of the gameplay. Lastly, the game’s story creates a very dense atmosphere and, at least for me, provides many points where players can associate with when they already experienced those situations themselves. In sum, by presenting and providing Max’s feelings and thoughts in a direct way, Life is Strange achieves a very immersive, atmospheric and emotional gameplay. It is easy for players to associate with her, especially when they have experienced some of her stories themselves. This week: This time, I think about a special entertaining aspect that can occur when an early access game is played. Early access computer games are a special form of games as they are still in development and hence lack integral game mechanics that will be implemented in the future. Despite not being complete, early access computer games can already be very entertaining and provide players with an interesting and often even innovative gameplay. The main reason for early access games to exist is a result of the good availability of powerful game engines and the emergence of independent game designers who develop games without being supported by a computer game publisher and hence use the revenue generated by selling early access games for the purpose of funding their developments. In addition, early access games are also used in order to improve the quality of a computer game as players often provide useful feedback about the current status of the game. Despite being incomplete, the gameplay of those games often is not that different to the gameplay of full-fledged games. The reason for this is that the gameplay of any computer game is a result of a player’s interactions with the game world by executing the provided game mechanics. Naturally, a player of an early access version might not have the same possibilities like a player of the game’s final version, but this does not affect the enjoyment of the game’s current early access version. However, playing early access games can also result in some unexpected problems that are a result of the game not being polished and finished. This especially is problematic when some errors and bugs result in the game being instable or even unplayable. In such a case, players rarely enjoy the gameplay as they get annoyed by the game constantly crashing on them or showing severe performance issues. However, experiencing errors and discovering not fully polished gameplay elements can also result in some hilarious moments when certain actions lead to completely unexpected outcomes, such as hostile creatures getting stuck on tiny obstacles due to issues with their path finding routines or game objects breaking the laws of physics due to errors in the game’s physics engine. As a result of this, players, depending on their interest in exploring the game world, dedicate a large part of their early access gameplay to the exploration of the virtual worlds in order to test a game’s limits and experience events that were not intended by the designers. This, however, is not unexpected as the explorer trait of computer game players often goes along with the desire to develop an in-depth understanding of the game’s underlying principles and mechanics. In sum, early access games have shown that games do not need to be complete in order to be enjoyable. Instead, the factor of incompleteness can even cause a different aspect of entertainment as players are able to experience hilarious moments that will not be a part of the final game as they are a result of an error. This week: This time, I think about how computer games present failures in an entertaining way that even encourages players to retry the game with a different approach. Experiencing failures is an integral part of playing computer games. At the beginning of a new game, a player must develop an understanding for the game’s game mechanics which quite frequently goes along with experiencing failures and problems that, in the end, provide the player with valuable feedback about the underlying principles and rules. Once players have developed an understanding for the game mechanics, failures can still be a regular thing when they start to put their skills to a test and/or try to reach the limitations of the game world. Normally, when we experience a failure in real life, then it often feels like a huge setback. Our expectations, ideas or dreams were proven wrong, crushed or, at least, pushed back thus requiring us to try a different approach which often is time consuming or at least requires additional resources. Although this is not different in a game world, a computer game makes experiencing failures more enjoyable as it is mostly very easy to start over again with a completely different approach. In addition, digital games provide savegames that can be loaded in order to retry a certain approach to analyze the steps that ultimately cause the failure. Moreover, certain computer games also offer a replay function that allows for a direct analysis of the experienced failure for the purpose of learning from the own mistakes. Furthermore, computer games often demonstrate failures in spectacular ways that are entertaining to watch and sometimes even cause hilarious moments. For instance, a not well designed rocket in Kerbal Space Program disassembles in a rapid succession which, although it also can happen to real world rockets, just looks spectacular and can cause funny moments when some boosters continue to fly in all various directions. This often becomes even more hilarious when players start to test the limits of the game world as, when those limits are broken, it can result in completely unexpected outcomes that let the player fly through the air or end in locations where they do not want to be. In sum, by presenting failures in an entertaining way and providing features that allow for a quick retry, experiencing problems in a computer game rarely feels like a huge setback and often is even encouraging to retry it with a different approach. Moreover, due to the often hilarious and exaggerated demonstrations of a failure’s outcome, failures can also become an entertaining aspect of the gameplay. This week: This time, I think about the issues that evolve when a lack of unique content is compensated with a high amount of difficulty levels. World of Warcraft (WoW) provides players with a broad variety of different activities they can perform in the virtual world while playing the game. Most of these activities are designed to keep players busy once they have reached the maximum level with their avatars. Until this point, the probably most important goal for the majority of the players is to solve quests or complete dungeons for the purpose of gaining experience points that ultimately allow their characters to reach a new level which often also unlocks new skills or provides access to new regions. However, as soon as a player has reached the maximum level, the main incentive to continue playing the game is lost and must be replaced with other goals that keep the player interested in the game. One of the key game mechanics that keep players active are the group and raid dungeons where players can find powerful armor and weapons that ultimately increase the power of their avatars. As there is no guarantee that a particular item drops, players repetitively have to complete the dungeons to slowly collect their equipment, and, as a result of this, players are playing the game for a longer period of time. Depending on the skill level and composition of the group, the dungeons can be tackled on various difficulties thus providing a challenge for every player while still allowing all players to at least enjoy the special regions without being required to join a permanent group. In addition, as the items also become more powerful with a higher difficulty, this system provides an incentive for players to tackle the dungeon on the next higher difficulty to even further improve their avatars. Since the release of the Legion expansion, group dungeons can also be completed on a so-called mythic+ difficulty which ultimately provides 15 additional difficulty levels for the same dungeon. While changing a dungeon’s difficulty significantly raises the challenge for the players by increasing the enemies damage as well as health and providing them with more abilities, it does not change the environment itself. As a result of this, players are seeing the same environment over and over again while progressing through the various difficulty levels. Although this is a cheap and very effective method to keep players interested in the game, it can also cause a reduced interest in the game as, despite the higher challenges, it does not result in exciting new content. Personally, I especially started to notice a lack of interest in those mythic+ dungeons as they are relatively short and hence can be repeated in a quick succession. Normally, I am quite motivated when it comes to an increased difficulty that puts my skills to a test, but due to the high amount of different mythic+ levels, the feeling of doing the same thing over and over again greatly overshadows the motivating aspects of tackling a difficult challenge. In conclusion, providing different difficulty levels for the same content can result in an increased effect of the connected retention mechanisms while allowing every player to enjoy the virtual environments, but, at the same time, it can also reduce the motivation of players who prefer to explore new environments. It would be very interesting to see more unique content that has only a single difficulty level again. This week: This time, I think about SpaceX’s successful flight of a reused Falcon 9 first stage. On March 31, 2017, at 00:27 GMT SpaceX’s Falcon 9 rocket began its ascent into space from the historic launch pad 39A at Kenedy’s Space Center with the mission to place a communication satelite in a geostationary transfer orbit. Although this launch sounds like a regular rocket launch, it was totally different as the Falcon 9 first stage already flew into space once on April 8, 2016 carrying a Dragon spacecraft and subsequently landed back on a barge in the Atlantic Ocean. During this first flight, the first stage logged about 9 minutes of flight during which it experienced the stresses of the ascent, reentry as well as landing. Almost a year later, after being inspected, refurbished and tested, the Falcon 9 first stage basically repeated its first flight by carrying the second stage as well as the communication satelite into space and landing back on top of the autonomous spaceport drone ship ‚Of Course I Still Love You‘ floating in the Atlantic Ocean. In addtion to this impressive achievement, SpaceX also tried to recover and reuse the fairing shells that protected the payload against the rough conditions of an atmospheric flight during the initial phase of the launch. Once the rocket has escaped the atmosphere, the fairing gets jettisoned and falls back to Earth. This time, however, the two fairing parts were equipped with small thrusters and a steerable parachute thus allowing them to reenter the atmosphere and fly towards a designated landing area. This first test of a recoverable fairing worked out quite well as SpaceX was able to recover at least one of the two fair halves. Ultimately, SpaceX’s main goal is to reduce the launch costs by reusing most of the rocket parts for subsequent launches. Moreover, this not only will make space flight more affordable, but also protect the environment. The only thing that is left over, is the rocket’s second stage which, so far, is not intended to be reusable. However, it might be possible that SpaceX engineers will start to work on concepts to make it reusable, soon. The next special SpaceX launch might take place in late summer this year, when the Falcon 9 Heavy could fly for the very first time.